Welcome to the Homer Lea Research Center, where I will be sharing select reference materials I collected in researching the book, Homer Lea: American Soldier of Fortune (part of the Association of the U.S. Army “American Warrior” series). I have been researching Homer Lea off and on since 1979, when, as a graduate student in history at Ohio State University, I first discovered him. I went on to write my Ph.D. dissertation about him at Kansas State University in the mid-1980s, and began expanding upon that research in the late 1990s as the internet opened new vistas for researchers. Although I researched a wide variety of primary sources, only a percentage of this material was included in the book. For example, the website’s photographic section has more than 100 images, most of which could not be included in the book due to space limitations by the publisher. The website also contains a listing of newspapers precluded from inclusion in the book due to space limitations. No reproduction or distribution of any photography on this website permitted. Although Homer Lea was a prolific public speaker, there are to date only three known examples of speech transcripts that he delivered. The first instance is an address he gave to the first Pacific Coast Congress in November 1910, in which he reprised many points from The Valor of Ignorance relating to the defense of the Pacific coast from a Japanese invasion. California Governor James N. Gillett invited him to be a delegate to the congress, which convened in San Francisco and comprised approximately 300 civil, military, and commercial representatives who discussed specific problems affecting the region. Lea’s second recorded address was a December 1910 talk he gave to a banquet of the Army and Navy Officers’ Association, which focused on themes from The Valor of Ignorance, to commemorate the opening of the “Bivouac Grill” at the U.S. Grant Hotel in San Diego. Lea’s third recorded address was a July 1911 talk he gave to a men’s group at a New York City luncheon, prior to his departure for Germany, which also focused on themes from The Valor of Ignorance about defending the Pacific coast from a Japanese invasion. "The Swarming of the Slav"
After Homer Lea’s death in November 1912, a variety of myths became associated with his life and career. One of the more prominent of these is the mistaken belief that he had plans to write a third book entitled, “The Swarming of the Slav,” which would have completed his trilogy of The Valor of Ignorance (1909) and The Day of the Saxon (1912). Homer Lea’s writings included three books (available online, click for access), The Vermilion Pencil (1908), The Valor of Ignorance (1909)and The Day of the Saxon (1912), four published articles; “Can China Fight,” World Today (1907); “How Socialism Failed in China,” Van Norden’s Magazine (1908); “The Aeroplane in War: Some Observations on a Military Delusion,” Harper’s Weekly (1910); “The Legacy of Commodore Perry,” North American (1913);an unproduced play, “The Crimson Spider,” (1909), (Manuscript Division, Library of Congress); and an unpublished, undated, draft article, “The Defences of China,”(Hoover Institution on War, Revolution and Peace, Stanford University). No American was closer to Dr. Sun Yat-sen than Homer Lea (1876-1912). Lea, a frail five-foot hunchback who suffered from debilitating health, was an adventurer and writer who became Dr. Sun’s closest foreign adviser. He was instrumental in helping Dr. Sun formulate plans for the overthrow of the Manchu dynasty. 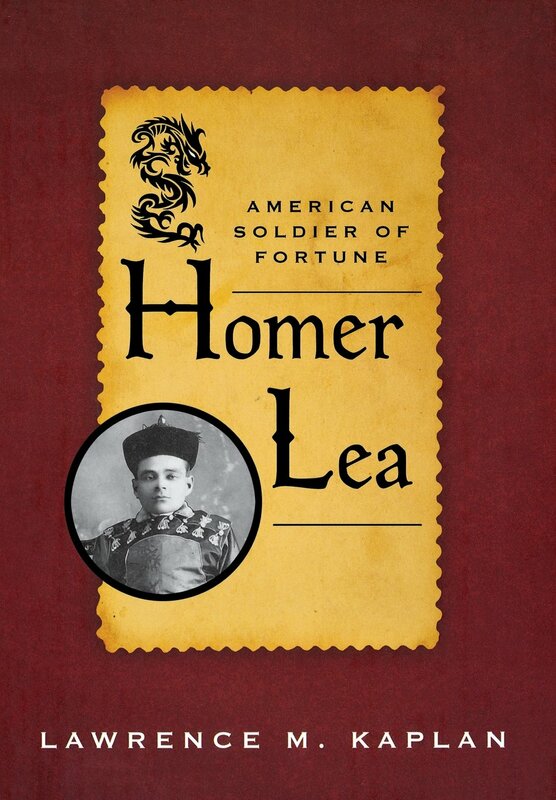 When I wrote Homer Lea: American Soldier of Fortune, and credited Homer Lea with being five feet, three inches tall, I based my findings largely on his sister Ermal’s statements and an interview Lea gave to a journalist. I overlooked an important document, Lea’s 1911 passport, which cited him as being five feet tall. As an official document, it is more reliable than the other two sources. About the Author: Dr. Lawrence M. Kaplan has more than 25 years experience as a military historian with the U.S. Army and the Department of Defense. He has a Ph.D. in American History from Kansas State University; an M.A. in American History from Ohio State University; and a B.A. in History from Ohio Wesleyan University. He also is the editor of John C. Tidball, The Artillery Service in the War of the Rebellion (Westholme Publishing, 2011); and the editor of Major General Henry D. Russell, The Purge of the Thirtieth Division (U.S. Naval Institute Press, 2014.